Graphs are generated for enabled languages, aliases are used while syncing. One can create a language set, which can be associated with a product release. Multiple instances of a translation platform can be added. A release should have a language set and a schedule attached. Transtats jobs talk to upstream repositories, translation platforms and build systems to keep translation statistics, build tags and release schedule latest. While adding a package, upstream URL is required. And package name is verified with selected translation platform. Translation of a package can be tracked for multiple products. Package should be sync'd with translation platform and build system. Once sync'd, branch mapping will be created. It maps Transtats releases with most suitable project versions available at translation platform and with appropriate build tags. Package can be sync'd with upstream repo as well. Once we have all versions / tags mentioned in branch mapping of a package sync'd with either translation platform and build system, differences can be created and observed. This answers - for a package - latest translations are packaged or not? If not, is some patch applied at the last moment? Which languages need attention? 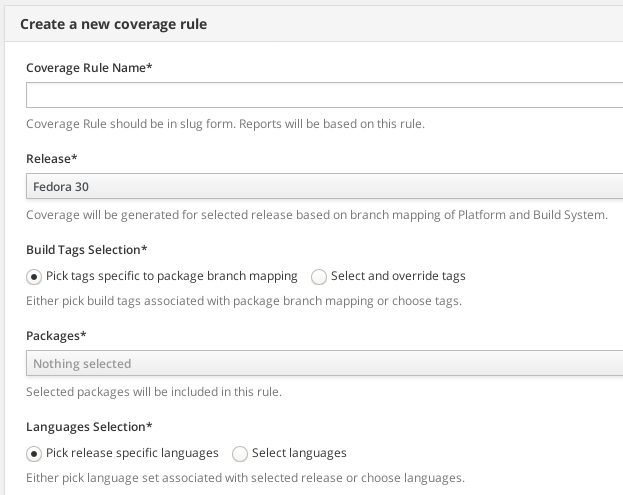 Coverage (translation status of a group of packages in a set of languages to a given release) are based on rules. Slug form of rule name would be saved. This should be specific for a product release. Packages having branch mapping created can only be included here. Languages could be picked from language set associated with the release or from enabled ones. Somehow if a package is not tracked for the respective product and selected for inclusion; Transtats would show an error. Transtats has two traversal options: releases and packages. One can see high level summary and can pick any one release or a package for details. 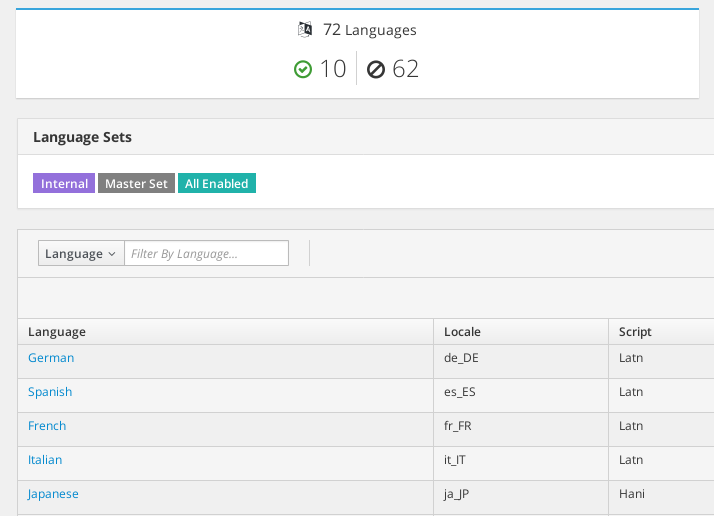 Summary can tell you - packages which are out of sync, translation workload estimate for each language per release, and much more. Another is coverage, which depends on rules and branch mapping. Is Transtats project open source? Where we have docs written? Yes. Source code is available at GitHub. Projects website is transtats.org and point your browser to docs.transtats.org for complete documentation. Which translation platforms and build systems are currently supported? Transtats supports DamnedLies, Transifex and Zanata. Transtats can talk to koji build system. What is branch mapping? And why is it important? On the basis of this, translation differences/gaps are calculated/located. 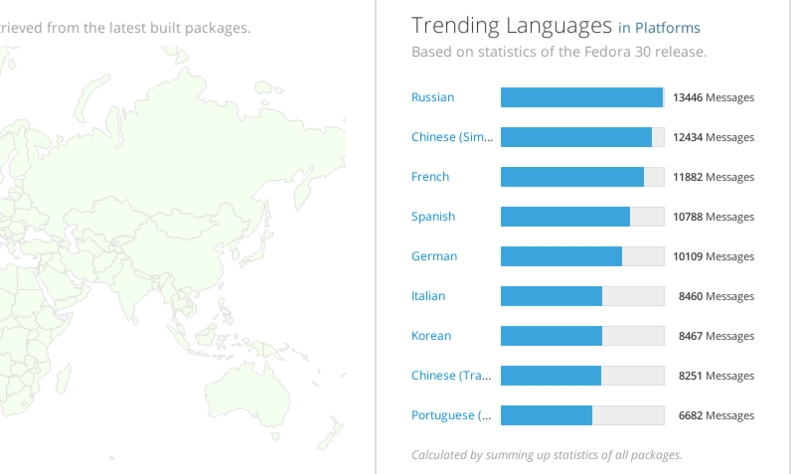 How to figure out which languages need attention for any of the packages? Please navigate to package details page. 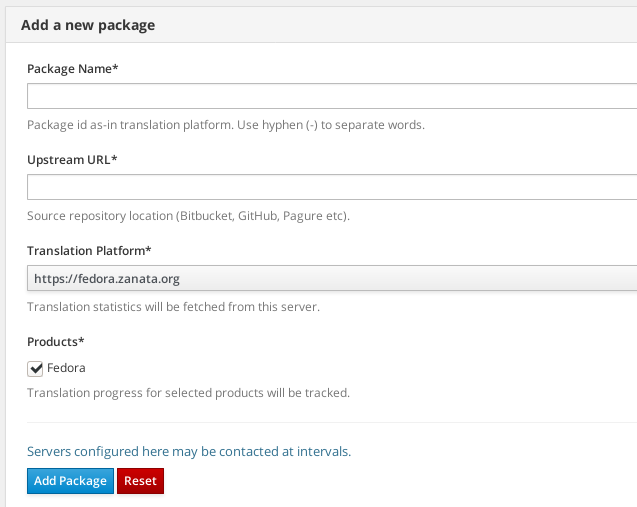 Sync the package with translation platform and build system (use shortcuts). Update branch mapping. Once all the mapped branches get sync'd, update statistics diff. Here you could find an answer to this! Broadly two categories: Predefined and YML based. Predefined jobs fill data required by various work-flows. syncbuildtags should be run first (one-time), as it is required for branch mapping and syncdownstream jobs. Three templates are available in YML based jobs: syncupstream, syncdownstream and stringchange. Why YML based jobs are introduced? YML based jobs add great level of flexibility by broadening capabilities to interact with build systems, translation platforms and source repositories. Which YML job to run when and why? They can be run in any order. Just that required values should be obeyed. 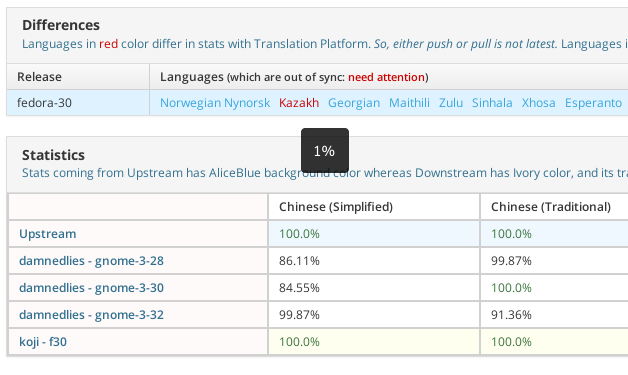 To collect translation statistics from package source repository, syncupstream job can be triggered. This job can only be run for added packages. Using syncdownstream job, one can inspect translation files and generate statistics in latest built SRPM. This applies patches (as-per SPEC file) also. Translation string change can be detected using stringchange job. This is highly flexible. Requires package branch mapping and POT command. How to look and share for details about a YML job ran? Please navigate to job log details page. Here you would find the YML supplied to the job and respective output of each task. If the job type is stringchange msgid diff found in translation template would be available along with full line-by-line file diff. This URL can be copied and shared. I like the idea and want to contribute, how should I start? You're welcome! Please read contributing guide to get started. While working with Transtats I got an issue, how should I report it? Feel free to create a GitHub Issue or join #transtats channel at IRC freenode. Where to find what features will be available in coming Transtats release? Please see roadmap in docs. You may also like going through changelog.